New Delhi [India], Jan 17 (ANI): Twinkle Khanna wished her husband Akshay Kumar by sharing a beautiful post dedicated to him and their 18 years of marriage. New Delhi [India], Dec 29 (ANI): Twinkle Khanna, who shares her birthday with her father Rajesh Khanna penned a heartfelt note for her daddy dearest remembering him on his birth anniversary. You need to see Twinkle Khanna's throwback Thanksgiving picture! New Delhi, [India] Nov 22 (ANI): Twinkle Khanna treated her fans with a beautiful throwback picture on the occasion of Thanksgiving and the photo will certainly give you some major vacation vibes. New Delhi [India], Oct 31(ANI): Touted to be one of the spookiest night of the year, Halloween has dawned upon us and Bollywood divas Twinkle Khanna and Preity Zinta are all geared up for it. 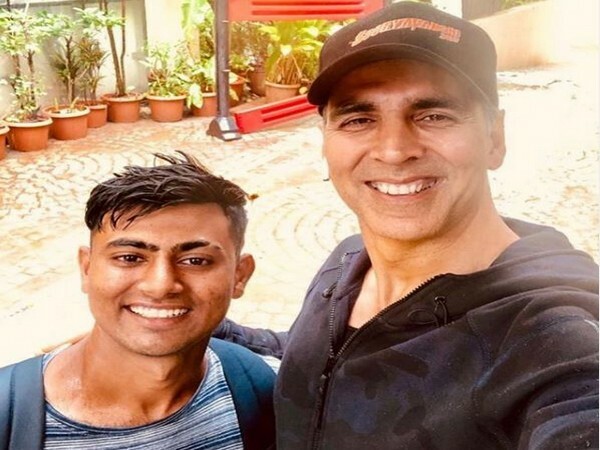 New Delhi [India], Sep 15 (ANI): Doting father Akshay Kumar has a heartfelt wish for son on the occasion of his 16th birthday. New Delhi [India], Sep 14 (NewsVoir): In line with their philosophy of innovation and excellence, Kohler, a global leader in bath and kitchen design, has launched a creative campaign collaboration with Twinkle Khanna on air. New Delhi [India], Sep 9 (ANI): Akshay Kumar turns 51 today and wife Twinkle Khanna has an adorable birthday wish for her "lovely Mr K."
New Delhi [India], May 26 (ANI-NewsVoir): Known for their Bold approach in the industry, Kohler Co., the Global Leaders in the Kitchen & Bath Industry, partnered with interior designer, author and former Bollywood actress Ms. Twinkle Khanna for their latest campaign, 'Colours by Kohler'. New Delhi [India], May 09 (ANI): Bollywood couple Akshay Kumar and Twinkle Khanna have been issued a legal notice for auctioning the naval uniform that the actor wore in 2016 film 'Rustom' as they have "played with the sentiments" of those serving in different armed forces. Mumbai (Maharashtra) [India], May 01 (ANI): Bollywood actor Akshay Kumar on Tuesday defended his wife Twinkle Khanna, who is being trolled for auctioning naval uniform from the film "Rustom". Mumbai (Maharashtra) [India], Apr 12 (NewsVoir): In line with their philosophy of innovation and design excellence, Kohler, a global leader in kitchen and bath design, will collaborate with Twinkle Khanna for their upcoming campaign on colours in the bathroom.